Pollution from Chicago’s two coal plants has created up to $1 billion in health and related damages in the last 8 years, according to a report released October 20, 20210 by the Environmental Law & Policy Center (ELPC). The report uses data from the National Research Council that found that particulate matter, or soot, from the Fisk and Crawford coal plants in Chicago created $127 million in health and related damages in 2005. Using that model, ELPC analyzed pollution emissions data and found that the two plants have created between $750 million and $1 billion in public health damages since 2002. Chicago’s Fisk and Crawford coal plants are located in more densely populated areas than any other coal plants in the nation. The plants are still running equipment built between 1958 and 1961 and the plant’s owner, Midwest Generation, has not installed modern pollution controls such as scrubbers. ELPC’s report, titled “Midwest Generation’s “Unpaid Health Bills”: The Hidden Public Costs of Soot and Smog from the Fisk and Crawford Coal Plants in Chicago” examines recent scientific research on the health effects of soot and smog pollution from coal plants. A variety of authoritative scientific panels have found that particulate matter pollution from coal plants harms public health, causing premature death, heart attacks, cardiovascular and respiratory disease and other problems. The economic impact of these health problems is borne by the public. The report adds new information to the debate on how Chicago’s coal plants should be operated and regulated. ELPC and other community health and business groups have advocated for reducing pollution from the Fisk and Crawford coal plants for years. The groups are currently supporting the Chicago Clean Power Ordinance, which would require Fisk and Crawford to drastically reduce particulate matter and carbon dioxide pollution within 3-4 years. A federal lawsuit also alleges that Midwest Generation’s coal plants have violated provisions of the Clean Air Act. Click here to download a copy of Midwest Generation’s “Unpaid Health Bills”: The Hidden Public Costs of Soot and Smog From the Fisk and Crawford Coal Plants in Chicago, prepared by Environmental Law & Policy Center. 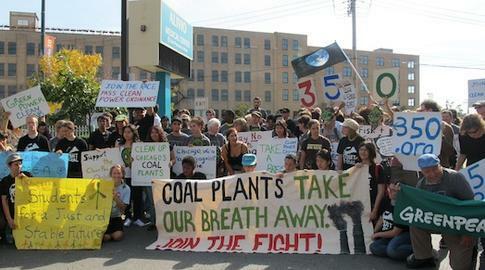 Click here to learn more about the Chicago Clean Power Coalition and campaign. EJC is a founding partner of the Chicago Clean Power Coalition, working to clean up or shut down Chicago’s coal plants and to bring about a clean energy future for Chicago!